First off, this is one of my favourite films of the year. Miles Teller and J.K. Simmons give powerhouse performances. Teller is brilliant as the aspiring drummer who will do whatever it takes, sacrifice whatever he must, to make it to the top. Simmons is electric as the terrifying music instructor who does not accept anything less than perfection. He is my favourite for Best Supporting Actor at the Golden Globes (and hopefully the Oscars) this year. One of the best scripts of the year. This is the one imperfection of the film. There are a vast number of black actors in the film, who are featured prominently onscreen, but none of them have any lines. There are also only 3 female characters in the entire film, one of which is used as a sexist joke in the band, another is simply a stepping stone for our protagonist, and the other is the protagonist’s aunt, who hardly speaks at all. Also, none of the female characters ever interact with each other. 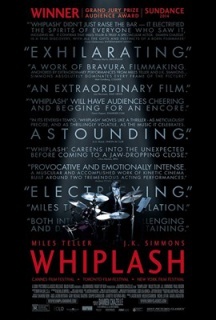 I’m really not a fan of drums, as I think I said in my Birdman review, but I absolutely loved the score for this film. It’s a pity that the Academy has nixed it (and Birdman) from its shortlist of contenders for Best Original Score. There’s not a whole lot to this one. But there was a LOT of blood and blisters, and it was so realistic that it succeeded in making me both nauseated and sympathetic for Miles Teller. The story was incredibly engaging, and so intense. I don’t think I’ve ever watched a film with bated breath that wasn’t either an action or a horror film. The drum solo at the end could have been about 5 minutes shorter than it was. Though the main character is arrogant and pontificating, the film never comes off as such.